Its Sunday again~ Not going out with friends today, pretty boring, what else can I do to cure this boredom, so I pick a movie to watch tonight^^. Behind every great love is a great story. The movie starts in a modern-day nursing home, an elderly man named Duke begins to read a love story from his notebook to a female fellow patient who has lost her memory. And this story set in 1940, at a carnival where a local country boy Noah Calhoun sees 17-year-old heiress Allie Hamilton for the first time and is immediately fall in love with her. Allie continue to refuse Noah persistent advances until their friends lure them together and after that midnight walk they spend everyday together for that summer until Allie's parent forbidden her to see Noah again and the family move to New York. Noah, devastated by their separation, writes her one letter every day for a year, with no replies. After seven years, they meet each other again but Allie had engage to Lon Hammond, Jr., a wealthy and well-connected young lawyer who is handsome, sophisticated, charming, and comes from an old Southern family. Who will Allie choose?? Summer romances end for all kinds of reason. But, when all is said and done, they ahve one thing in common - they are shooting stars, a spectacular moment of light in the heavens, a fleeting glimpse of eternity and in a flash they are gone. 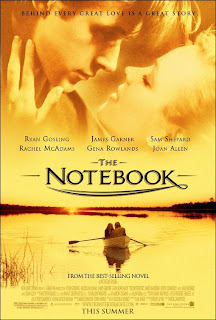 dun owis thk love love loa..
Wa, so romantic, the notebook. Haha. I only read the book, nvr got a chance to watch the movie.